New Seeds, Here We Come! Two of my favorite catalogs have updated their online listings for 2014. I’m excited for next year already! If you see something neat that we should try, leave a comment! We removed the remaining plants from the Demo Garden today, and I’ll share those pictures and thoughts with you over the next few weeks. I wanted to start with this one, though! 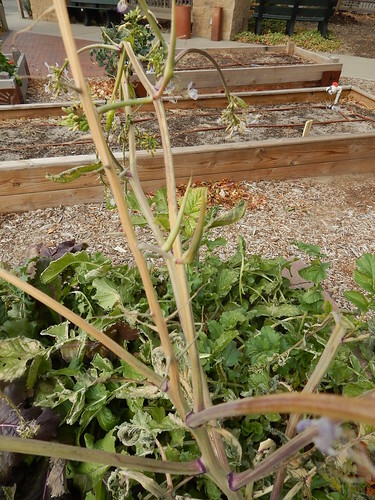 The Rattail Radishes are grown for their edible seed pods that can be stir-fried or eaten raw. From that standpoint, our planting was a bit of a failure. If I had thought it through before, I would have realized that expecting a root vegetable to bolt in the fall was a sketchy proposition. Only one of the plants managed to bolt and flower. 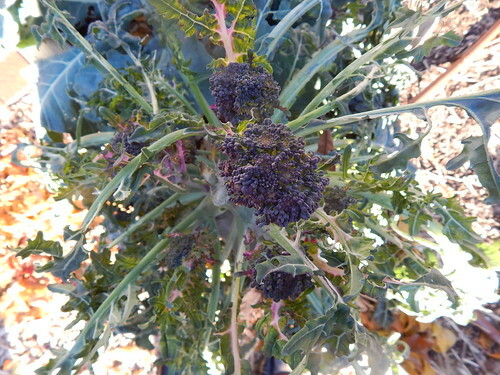 Even then, only a few of the flowers turned into seed pods before it got too cold. Those green spikes in the middle of the picture? Those were the two, lonely “rattails” from this endeavor. The exciting part was pulling the plants up! Look at those roots! That one huge one is at least 15″ long. You can see, looking at these, why some types of radishes are recommended for planting as cover crops. Those roots can help loosen clay soil, and they mine the deeper soil for nutrients. 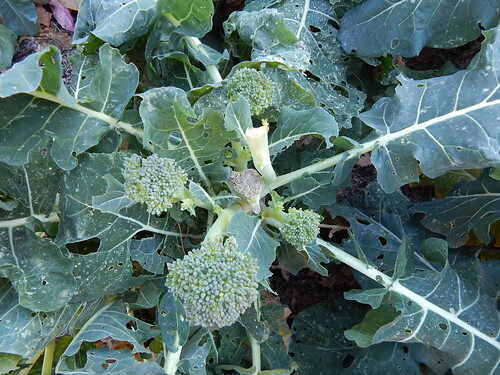 Then those nutrients are available in the upper part of the soil as the plants decompose after freezing in the winter. Anyway, these roots aren’t really meant for consumption (although I’m sure you could eat them if you wanted to), but we wanted to cut the big one open to see what the inside looked like. As you can see, there’s a nice crack down the center of the root. It was probably caused by moisture fluctuation or overly fast growth. I did taste a piece of it, and it was really watery and fairly bland. The texture wasn’t completely pithy yet, but it was getting there. Yuck! Most of you probably know by now that I get really excited about different, strange, or new vegetable varieties. (Maybe the reality is that I get bored easily with the regular varieties.) Of course, there is no better way to have crazy varieties to try than to look at heirloom varieties. Now, the caveat when you start growing heirlooms is that you have to understand that the yield may be lower, the plants may be larger/more vigorous/gangly, and they may be more disease susceptible. Still, boring is not a word you would typically use to describe the experience of growing heirlooms. If you want to learn about heirlooms and have the opportunity to browse through all the options, Seed Savers Exchange is a great place to start. Seed Savers is based in Decorah, IA at the Heritage Farm. They grow out heirloom seeds that they have collected over the years to produce seeds that you can purchase or that they can store to keep the genetics of those plants available for the future in their seed bank. Visiting the Heritage Farm is definitely on my bucket list! Seed Savers publishes a catalog of heirloom vegetables, flowers, and herbs that you can purchase from them, which is great. Even better though, is to have the opportunity to browse through their Seed Exchange Yearbook. The yearbook is a huge book where gardeners from all over the world can list the heirloom varieties that they have grown and have seeds to exchange. There are thousands of entries! To get the Yearbook, you have to be a member of Seed Savers. A 1 lb, wedge-shaped, pink tomato! Where do I sign up? Of course, that’s the catch. You can now see the listings without having a membership, but you still have to become a member if you want to get these varieties. Some varieties are rare and you have to agree to save seeds to get some seeds to grow out. If you are sad that it is December and can’t wait for spring, then you should click on over and browse through their listings. If you get serious about trying some heirlooms, you might want to look for seeds that have been grown and saved in more southerly locations, because they will probably be better adapted to the heat of a Kansas summer. Ah, the best laid plans…! Obviously I didn’t get very many posts done this week, since a whole host of other things claimed my attention. I think that we are probably done with Friday PhotoEssays until next year unless we get some picturesque weather. In a month or so, we may do some catalog reviews/new variety reviews as those catalogs start rolling in. For now, I have a few more topics to blog about from the fall portion of the garden, starting with a look at some of the root vegetables. Some of the radishes and turnips were looking ready to harvest, so I pulled the biggest ones and got some good pictures. (You may have guessed that from the Radish Salad recipe that Denise posted on Monday.) I also pulled a few of the parsnips, since some of them are supposed to be better for fall harvests and some are better for spring. We have 3 varieties of turnips. 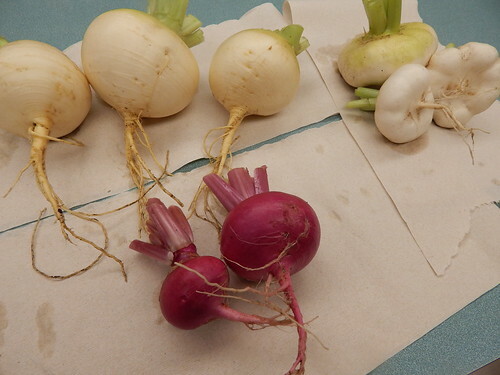 From the upper left, going clockwise: Golden Ball turnip, Early Flat White turnip, and Scarlet Queen turnip. 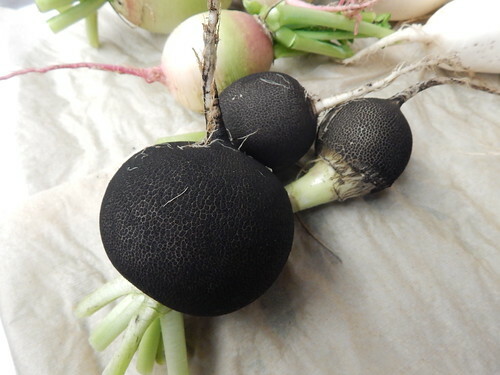 There were some larger Scarlet Queen turnips a couple weeks ago that I gave to a Master Gardener to try a soup recipe. All of these varieties look good and productive. 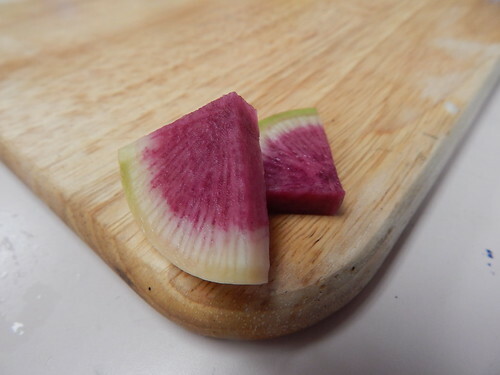 The Early Flat White turnips seem like they might be a little more difficult to deal with due to the shape. 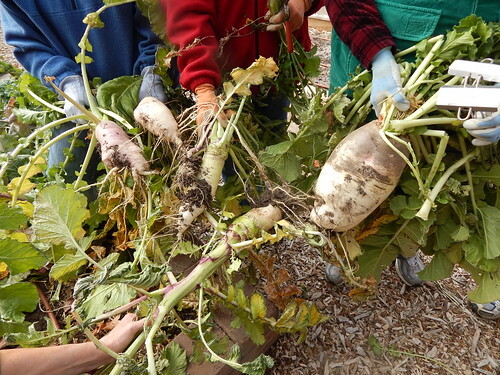 These turnips all went into a Turnip & Parsnip Gratin that we had at a Master Gardener class. 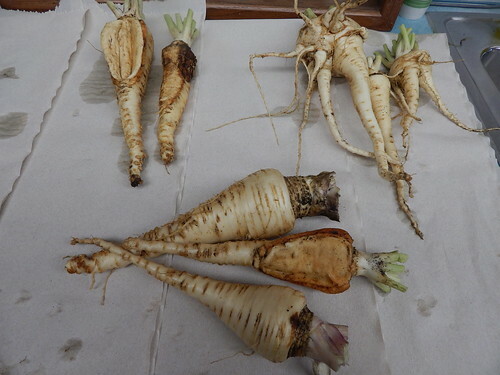 As you can see, there are some interesting things going on with the parsnips! Varieties, again from the top left, going counter-clockwise: Javelin, Albion, Cobham Marrow Improved. The 3 problems in evidence with these varieties are side-splitting, forked roots, and some type of canker. My As you can see, both of the Javelin parsnips are problematic (I had pulled a third earlier that was also split), one with a split and one with a canker. The Albion parsnips displayed two crazy forked roots and one small, nice root. 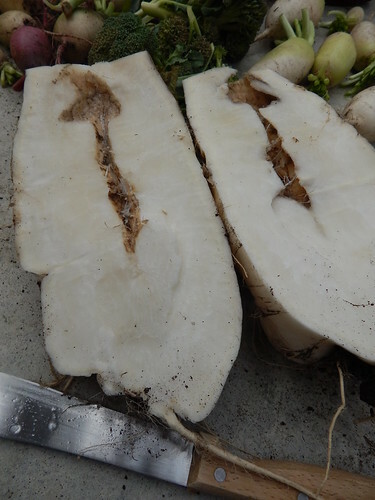 The Cobham Marrow Improved had two nice roots and one split. So what happened here? My suspicion is that the side splitting is probably due to moisture fluctuation, if you can imagine that! The canker could quite possible be Parsnip Canker or some other type of root rot/root damage. The forking roots is what has me really confused. Usually forking roots like that is indicative of one of two things: root knot nematodes (please, no!) or a physical obstruction that caused the roots to split (really, in a sand + compost soil?). I did see some references to excessive nutrients causing the forking, but there weren’t a lot of reliable sources for that. I didn’t see other signs of nematodes, so I guess something else happened with the Albion parsnips. When we pull the rest of them, we may see if I just had bad luck pulling those two or if there’s something about that variety that is problematic. Just form this sample, it would seem that the Cobham variety did the best. We’ll have to see what the final harvest brings! Ah, the fall radishes. Aren’t those daikons enormous? 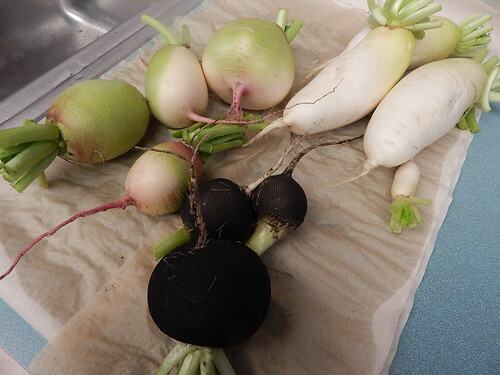 From the top left, clockwise: Watermelon radish, Alpine Daikon radish, Nero Tondo (Black Round) radish. Again, all of these varieties look great, and I’m particularly impressed with the daikons. 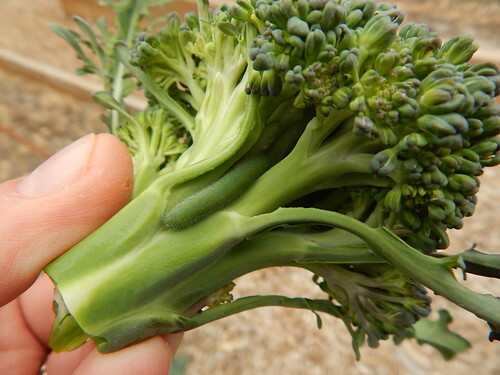 They could be longer, but this variety isn’t one of the really long ones. 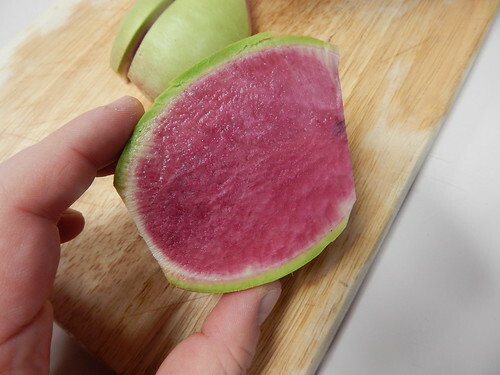 I’m really happy with the color on the Watermelon radishes this year. Sometimes the center color is much more faded or only in the very center. 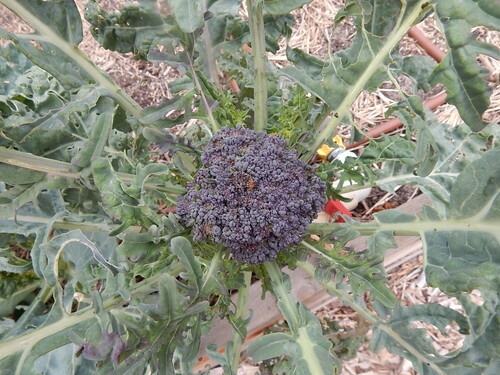 I wonder if it is due to the weather or to the seed source this year. We got our seeds from High Mowing, which is different from where I’ve purchased them in the past. Watermelon, anyone? Okay, that would be just mean, wouldn’t it? I think we are going to pull the remaining root vegetables and harvest some of the greens next Tuesday, since there is a forecast low of 22 on Tuesday night. (Yes, I know it will probably change. Yes, I know the roots probably won’t be damaged anyway. Yes, I know we could put on row covers.) I think most of the roots are just about as big as they are going to get for the year, so we might as well get them pulled out. Stay tuned!